This website is about the Leechwell Garden Association. 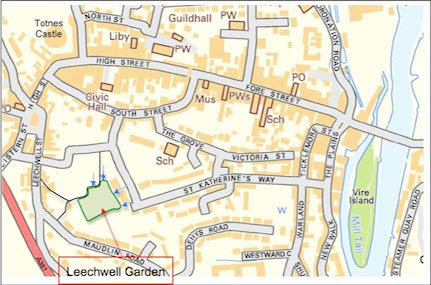 The Association was formed in January 2009 with the primary purpose of managing, in association with the landowner (currently SHDC), the public open space in Totnes known as the "Leechwell Garden" for the benefit of the people of Totnes. The association is open to everyone (the annual subscription is currently waived) - instructions for joining can be found here. The Association is affiliated with the Royal Horticultural Society. The Leechwell Garden is open from 8.30am until dusk (or 8.30pm if this is earlier). From mid-April until September the garden will be open from 8.30am until 8.30pm, while as the days get shorter it closes earlier until by mid-December it's around 4.30pm. The garden is closed on Christmas Day. 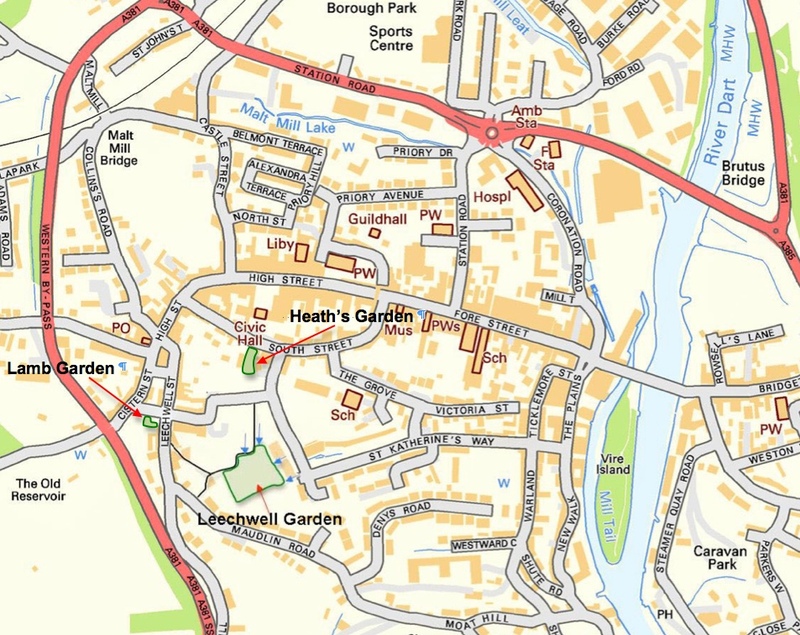 Click on the map for a larger version, which also shows the location of Heath's Garden and the Lamb (Gardening for Health) Garden. On Wednesday 22nd March 2017 Councillor Peter Smerdon of SHDC and Cllr Judy Westacott of Totnes Town Council, ably assisted by members of the choir of Grove School, opened the new play facilities. In November 2016 we submitted a successful application for the Leechwell Garden to be included in the Totnes Neighbour Plan. You can read the application here. August/September 2016 - we are installing a solar-powered watering system for the Herb Garden. You can see more about it here. If you are interested in using the garden to host some sort of communal activity, please contact Catherine Munro - either by phone at 07582125438 or email to catherine@gardeningforhealth.org.uk. the garden is meant to be relatively peaceful, so no loud, amplified music for example. On Sunday 16th October 2011 we held an event in the garden celebrating its first anniversary. The highlight was the unveiling of Rosie Musgrave's "Three Guardians" sculpture. This film featuring the event was produced by Emma Goude for the LGA and Totnes Development Trust. The Leechwell Garden forms part of the Southern Area of Totnes, which until recently was open space devoted to horticulture. In the 1980's South Hams District Council acquired most of the land, built a road linking the top of the town with the Plains and began planning how to develop the area. Over the next twenty years several plans were produced but none were taken further. In 2003 a local community organisation (Save Our Space, later Design Our Space) was formed to oppose the latest SHDC development plan for the area. The result was a community-generated plan for the area which involved building on four sites and creating a new public open space - the Leechwell Garden. Funding for the initial development of the garden (some £150,000) was being provided by SHDC and Midas. In addition, DOS transferred the bulk of its remaining funds (£400 approx) to the LGA. The LGA applied for and was granted a £50,000 grant from Community Spaces. You can see all the application documents we have produced here. You can find out more about various aspects of the LGA by clicking on the headings at the top of the page. Click here for how you can help.